When you buy an old bar, you get more than the architecture, plumbing, walls and roof. You also buy a canvas. It’s not blank: there’s faded paint and a tear or two. There are hard-to-read signatures, and stains the shape of pint glass bottoms. In the fall of 2013, Ryan Whipple bought a 103-year-old establishment at 178 N. Main St., Naugatuck, which means he bought a large building with a sprawling tin ceiling and lots of dark wood in a residential neighborhood off of Route 8. It’s his very own weathered canvas. Luckily for us, Whipple, 35, has an appreciation for history and a knack for getting new and exciting beers into your glass. 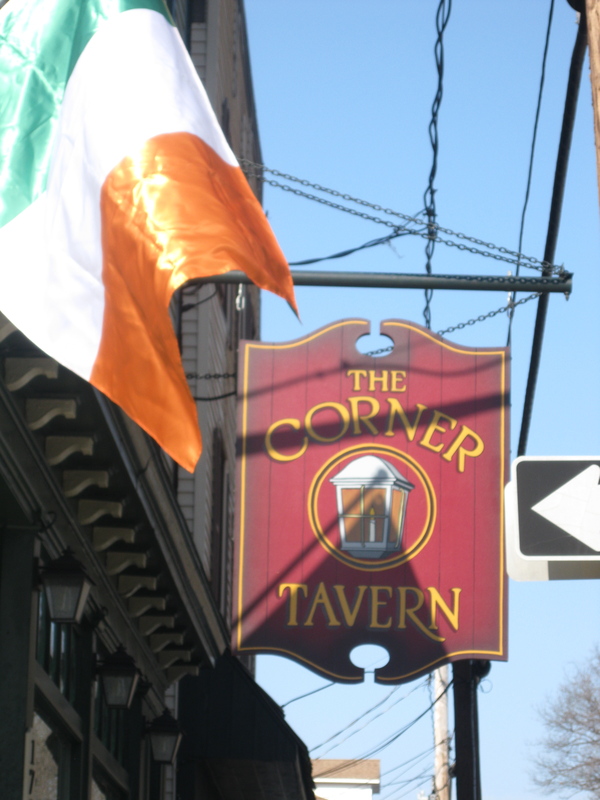 His bar is now called The Corner Tavern, but it started life as Behlman’s in 1911. In its corner of the borough’s Union City section, it has survived Prohibition, served customers who worked at the nearby mills, and withstood the punishing Flood of 1955. In 1972, a German-American with no restaurant experience named John Woermer bought the establishment and renamed it The Old Corner Café. He ran it for almost 40 years, establishing it as a family-friendly restaurant and bar, and cementing the tradition of holding grand St. Patrick’s Day celebrations. After a few years in the hands of Naugatuck businessman Eugene Ferreira, the bar became Whipple’s last September, and opened its doors two months later. The new version is a mix of old world and new. The walls and ceiling are still in great shape with fresh coats of paint. And it was a relief to see that Whipple had not replaced the urinals, each of which could pass for a small apartment. Additions include three giant flat screens, with another on the way. Whipple said he’s comfortable going into bar ownership because he’s seen the restaurant industry from many angles, since he was a child. His mother owned RJ’s, a pizza restaurant on New Haven Road (he was the “R” in the name). He bussed tables later on, and made his way to bars as soon as he legally could. It was as a DJ and host of karaoke nights in roughly 50 bars in the Waterbury area that allowed him to start scrutinizing the restaurant industry. “I’ve seen it done well and done poorly,” Whipple said. Whipple and co-owner Tara Mitro share responsibilities for jobs that they’ve learned over their years in the business, from replacing toilet paper to balancing the books. “You have to run your business like you don’t own it, at the level of service that you would want,” he said. 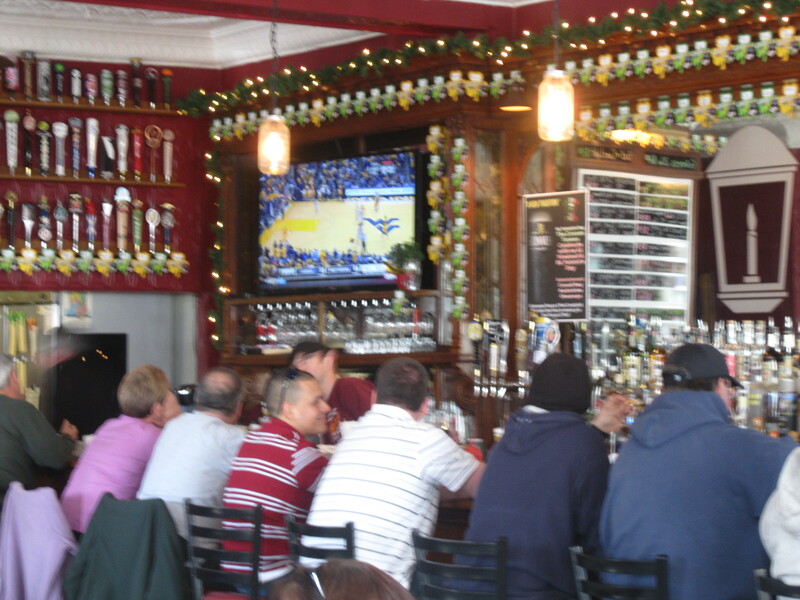 The biggest change from The Old Corner is the added emphasis on craft beer. With 27 rotating draft lines, Whipple has a broad palate to work with. Two lines are reserved for hard ciders (Angry Orchard and McKenzie’s are favorites), and there’s always a Budweiser and Coors Light line. 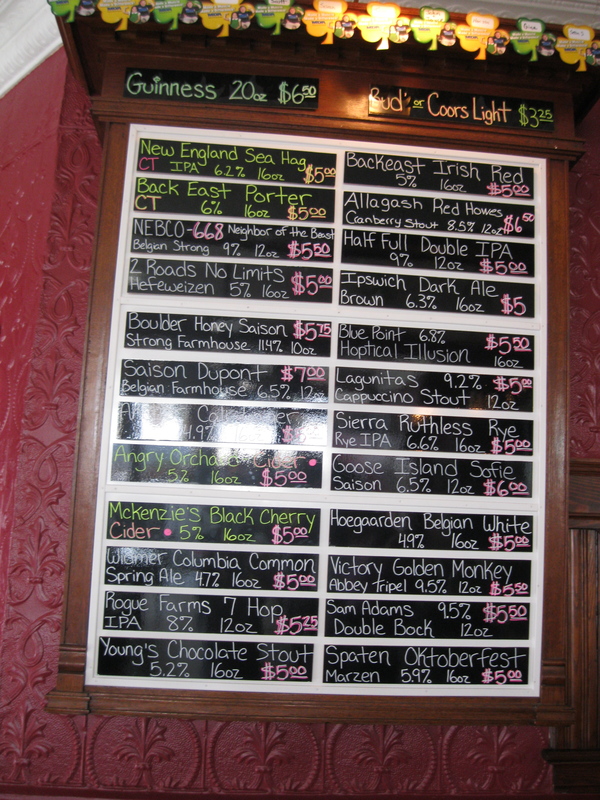 But other than that, the draft list is all over the place. Whipple tries to balance out the styles. He pays tribute to the bar’s German history by offering hefeweizens, doppelbocks and lagers. He’ll also carry a very bitter double-IPA (India pale ale) and a rich stout. On a recent trip, I had a porter from Back East Brewing of Bloomfield and a (late in the season) “holiday ale” from Two Roads Brewing of Stratford. 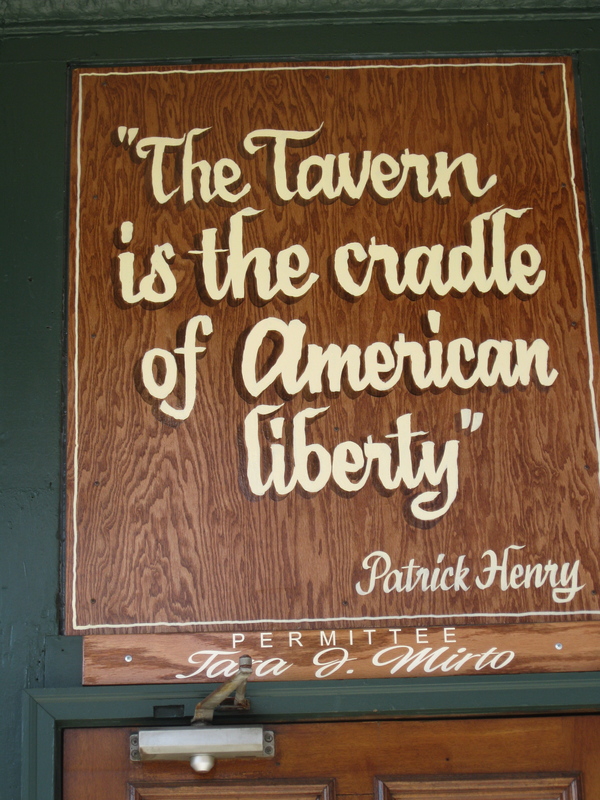 Whipple’s “gateway beer” (which brought him into the arms of better beer) was Sam Adams’ Cherry Wheat. The tendency might have started earlier, however. “I remember sitting on great grandmother’s lap when I was five, drinking a Budweiser and thinking it was terrible,” he said. Now he has a son of his own, Brayden, who’s five. 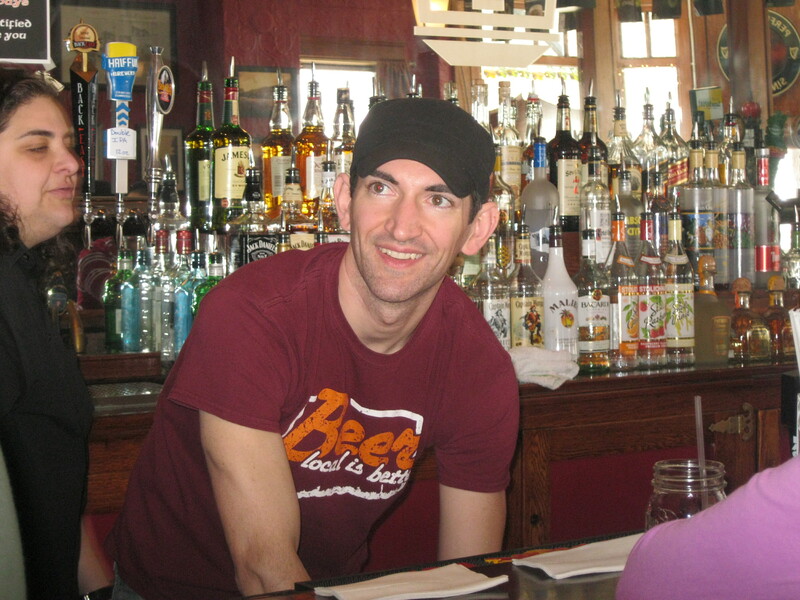 As Whipple told me that his son loves to wash glasses behind the bar, I was struck with déjà vu: John Woermer told me in 2009 about how his son at six also loved to wash glasses behind the bar. If a big building with some beautiful ceilings and urinals is to be more than just a building, it’s got to come from the heart of the owner. Whipple seems determined to show that his heart, as well as his head and wallet, are in the right place. This column was originally published in another form in the Waterbury (Conn.) Republican-American on March 12, 2014. This entry was posted in Beer Snob. Bookmark the permalink.